Joshua Reynolds was born 16 July 1723 in Plympton, Devon, England, United Kingdom and died 23 February 1792 in Leicester Fields, Greater London, England, United Kingdom of unspecified causes. For the Australian rugby league footballer, see Josh Reynolds. Sir Joshua Reynolds RA FRS FRSA (16 July 1723 – 23 February 1792) was an influential eighteenth-century English painter, specialising in portraits and promoting the "Grand Style" in painting which depended on idealization of the imperfect. He was one of the founders and first president of the Royal Academy, and was knighted by George III in 1769. Reynolds was born in Plympton, Devon, on 16 July 1723 the third son of the Rev. Samuel Reynolds, master of the Free Grammar School in the town. Samuel Reynolds had been a fellow of Balliol College, Oxford, but did not send any of his sons to the university. One of his sisters was Mary Palmer (1716–1794), seven years his senior, author of Devonshire Dialogue, whose fondness for drawing is said to have had much influence on him when a boy. In 1740 she provided £60, half of the premium paid to Thomas Hudson the portrait-painter, for Joshua's pupilage, and nine years later advanced money for his expenses in Italy. As a boy, he came under the influence of Zachariah Mudge, whose Platonistic philosophy stayed with him all his life. Reynolds made extracts in his commonplace book from Theophrastus, Plutarch, Seneca, Marcus Antonius, Ovid, William Shakespeare, John Milton, Alexander Pope, John Dryden, Joseph Addison, Richard Steele, Aphra Behn, and passages on art theory by Leonardo da Vinci, Charles Alphonse Du Fresnoy, and André Félibien. The work that came to have the most influential impact on Reynolds was Jonathan Richardson's An Essay on the Theory of Painting (1715). Reynolds' annotated copy was lost for nearly two hundred years until it appeared in a Cambridge bookshop, inscribed with the signature ‘J. Reynolds Pictor’. Having shown an early interest in art, Reynolds was apprenticed in 1740 to the fashionable London portrait painter Thomas Hudson, who had been born in Devon. Hudson had a collection of old master drawings, including some by Guercino, of which Reynolds made copies. Although apprenticed to Hudson for four years, Reynolds only remained with him until summer 1743. Having left Hudson, Reynolds worked for some time as a portrait-painter in Plymouth Dock (now Devonport). He returned to London before the end of 1744, but following his father's death in late 1745 he shared a house in Plymouth Dock with his sisters. In 1749, Reynolds met Commodore Augustus Keppel, who invited him to join HMS Centurion, of which he had command, on a voyage to the Mediterranean. While with the ship he visited Lisbon, Cadiz, Algiers, and Minorca. From Minorca he travelled to Livorno in Italy, and then to Rome, where he spent two years, studying the Old Masters and acquiring a taste for the "Grand Style". Lord Edgecumbe, who had known Reynolds as a boy and introduced him to Keppel, suggested he should study with Pompeo Batoni, the leading painter in Rome, but Reynolds replied that he had nothing to learn from him. While in Rome he suffered a severe cold, which left him partially deaf, and, as a result, he began to carry a small ear trumpet with which he is often pictured. Reynolds travelled homeward overland via Florence, Bologna, Venice, and Paris. He was accompanied by Giuseppe Marchi, then aged about 17. Apart from a brief interlude in 1770, Marchi remained in Reynolds' employment as a studio assistant for the rest of the artist's career. Following his arrival in England in October 1752, Reynolds spent three months in Devon, before establishing himself in London, where remained for the rest of his life. He took rooms in St Martin's Lane, before moving to Great Newport Street, his sister Frances acted as his housekeeper. He achieved success rapidly, and was extremely prolific. Lord Edgecumbe recommended the Duke of Devonshire and Duke of Grafton to sit for him, and other peers followed, including the Duke of Cumberland, third son of George II, in whose portrait, according to Nicholas Penny "bulk is brilliantly converted into power". In 1760 Reynolds moved into a large house, with space to show his works and accommodate his assistants, on the west side of Leicester Fields (now Leicester Square). Alongside ambitious full-length portraits, Reynolds painted large numbers of smaller works. In the late 1750s, at the height of the social season, he received five or six sitters a day, each for an hour. By 1761 Reynolds could command a fee of 80 guineas for a full-length portrait; in 1764 he was paid 100 guineas for a portrait of Lord Burghersh. The clothing of Reynolds' sitters was usually painted either by one of his pupils, his studio assistant Giuseppe Marchi, or the specialist drapery painter Peter Toms. James Northcote, his pupil, wrote of this arrangement that "the imitation of particular stuffs is not the work of genius, but is to be acquired easily by practice, and this was what his pupils could do by care and time more than he himself chose to bestow; but his own slight and masterly work was still the best." Lay figures were used to model the clothes. Although not principally known for his landscapes, Reynolds did paint in this genre. He had an excellent vantage from his house, Wick House, on Richmond Hill, and painted the view in about 1780. Reynolds also was recognized for his portraits of children. He emphasized the innocence and natural grace of children when depicting them. His 1788 portrait, Age of Innocence, is his best known character study of a child. The subject of the painting is not known, although conjecture includes Theophila Gwatkin, his great niece, and Lady Anne Spencer, the youngest daughter of the fourth Duke of Marlborough. Reynolds worked long hours in his studio, rarely taking a holiday. He was gregarious and keenly intellectual, with many friends from London's intelligentsia, numbered amongst whom were Dr Samuel Johnson, Oliver Goldsmith, Edmund Burke, Giuseppe Baretti, Henry Thrale, David Garrick, and artist Angelica Kauffman. Johnson said in 1778: "Reynolds is too much under Fox and Burke at present. He is under the Fox star and the Irish constellation [meaning Burke]. He is always under some planet". Because of his popularity as a portrait painter, Reynolds enjoyed constant interaction with the wealthy and famous men and women of the day, and it was he who brought together the figures of "The" Club. It was founded in 1764 and met in a suite of rooms on the first floor of the Turks Head at 9 Gerrard Street, now marked by a plaque. Original members included Burke, Langton, Beauclerk, Goldsmith, Chamier, Hawkins, and Nugent, to be joined by Garrick, Boswell, and Sheridan. In ten years the membership had risen to 35. The Club met every Monday evening for supper and conversation and continued into the early hours of Tuesday morning. In later years, it met fortnightly during Parliamentary sessions. When in 1783 the landlord of the Turks Head died and the property was sold, The Club moved to Sackville Street. Reynolds was one of the earliest members of the Royal Society of Arts, helped found the Society of Artists, and, with Gainsborough, established the Royal Academy of Arts, a spin-off organisation. In 1768 he was made the Royal Academy's first president, a position he held until his death. As a lecturer, his Discourses (delivered between 1769 and 1790) are remembered for their sensitivity and perception. In one lectures he was of the opinion that "invention, strictly speaking, is little more than a new combination of those images which have been previously gathered and deposited in the memory." William Jackson in his contemporary essays said of Reynolds ' there is much ingenuity and originality in all his academic discourses, replete with classical knowledge of his art, acute remarks on the works of others, and general taste and discernment'. Reynolds and the Royal Academy received a mixed reception. Critics include many Pre-Raphaelites, and William Blake who published the vitriolic Annotations to Sir Joshua Reynolds' Discourses in 1808. J. M. W. Turner and James Northcote were fervent acolytes: Turner requested he be laid to rest at Reynolds' side, and Northcote, who spent four years as Reynolds' pupil, wrote to his family "I know him thoroughly, and all his faults, I am sure, and yet almost worship him." In the Battle of Ushant against the French in 1778, Lord Keppel commanded the Channel Fleet and the outcome resulted in no clear winner; Keppel ordered the attack be renewed and was obeyed except by Sir Hugh Palliser, who commanded the rear, and the French escaped bombardment. A dispute between Keppel and Palliser arose and Palliser brought charges of misconduct and neglect of duty against Keppel and the Admiralty decided to court-martial him. On 11 February 1779 Keppel was acquitted of all charges and became a national hero. One of Keppel's lawyers commissioned Sir Nathaniel Dance-Holland to paint a portrait of Keppel but Keppel redirected it to Reynolds. Reynolds alluded to Keppel's trial in the painting by painting his hand on his sword, reflecting the presiding officer's words at the court-martial: "In delivering to you your sword, I am to congratulate you on its being restored to you with so much honour". On 10 August 1784 Allan Ramsay died and the office of Principal Painter in Ordinary to the king became vacant. Gainsborough felt that he had a good chance of securing it, but Reynolds felt he deserved it and threatened to resign the presidency of the Royal Academy if he did not receive it. Reynolds noted in his pocket book: "Sept. 1, 2½, to attend at the Lord Chancellor's Office to be sworn in painter to the King". It did not make Reynolds happy, however, as he wrote to Boswell: "If I had known what a shabby miserable place it is, I would not have asked for it; besides as things have turned out I think a certain person is not worth speaking to, nor speaking of", presumably meaning the king. Reynolds wrote to Jonathan Shipley, Bishop of St Asaph, a few weeks later: "Your Lordship congratulation on my succeeding Mr. Ramsay I take very kindly, but it is a most miserable office, it is reduced from two hundred to thirty-eight pounds per annum, the Kings Rat catcher I believe is a better place, and I am to be paid only a fourth part of what I have from other people, so that the Portraits of their Majesties are not likely to be better done now, than they used to be, I should be ruined if I was to paint them myself". In 1787 Reynolds painted the portrait of Lord Heathfield, who became a national hero for the successful defence of Gibraltar in the Great Siege from 1779 to 1783 against the combined forces of France and Spain. 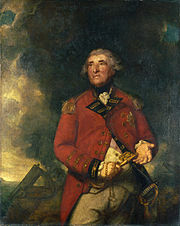 Heathfield is depicted against a background of clouds and cannon smoke, wearing the uniform of the 15th Light Dragoons and clasping the key of the Rock, its chain wrapped twice around his right hand. John Constable said in the 1830s that it was "almost a history of the defence of Gibraltar". Desmond Shawe-Taylor has claimed that the portrait may have a religious meaning, Heathfield holding the key similar to St. Peter (Jesus' "rock") possessing the keys to Heaven, Heathfield "the rock upon which Britannia builds her military interests". "to the splendor of the foliage, to the neglect of the stirring the earth about the roots. They cultivated only those arts which could add splendor to the nation, to the neglect of those which supported it – They neglected Trade & substantial Manufacture...but does it follow that a total revolution is necessary that because we have given ourselves up too much to the ornaments of life, we will now have none at all". When attending a dinner at Holland House, Fox's niece Caroline was sat next to Reynolds and "burst out into glorification of the Revolution – and was grievously chilled and checked by her neighbour's cautious and unsympathetic tone". On 4 June 1791 at a dinner at the Freemasons' Tavern to mark the king's birthday, Reynolds drank to the toasts "GOD save the KING!" and "May our glorious Constitution under which the arts flourish, be immortal! ", in what was reported by the Public Advertiser as "a fervour truly patriotick". Reynolds "filled the chair with a most convivial glee". He returned to town from Burke's house in Beaconsfield and Edmond Malone wrote that "we left his carriage at the Inn at Hayes, and walked five miles on the road, in a warm day, without his complaining of any fatigue". "I had long languished to see that kindly zealous friend, but his ill health had intimidated me from making the attempt": "He had a bandage over one eye, and the other shaded with a green half-bonnet. He seemed serious even to sadness, though extremely kind. ‘I am very glad,’ he said, in a meek voice and dejected accent, ‘to see you again, and I wish I could see you better! but I have only one eye now, and hardly that.’ I was really quite touched". On 5 November Reynolds, fearing he might not have an opportunity to write a will, wrote a memorandum intended to be his last will and testament, with Edmund Burke, Edmond Malone, and Philip Metcalfe named as executors. On 10 November Reynolds wrote to Benjamin West to resign the presidency, but the General Assembly agreed he should be re-elected, with Sir William Chambers and West to deputise for him. Doctors Richard Warren and Sir George Baker believed Reynolds' illness to be psychological and they bled his neck "with a view of drawing the humour from his eyes" but the effect, in the view of his niece, was that it seemed "as if the 'principle of life' were gone" from Reynolds. On New Year's Day 1792 Reynolds became "seized with sickness" and from that point could not keep down food. Reynolds died on 23 February 1792 at his house in Leicester Fields in London between eight and nine in the evening. Sir Joshua Reynolds was on very many accounts one of the most memorable men of his Time. He was the first Englishman who added the praise of the eligant Arts to the other Glories of his Country. In Taste, in grace, in facility, in happy invention, and in the richness and Harmony of colouring, he was equal to the great masters of the renowned Ages. In Pourtrait he went beyond them; for he communicated to that description of the art, in which English artists are the most engaged a variety, a Fancy, and a dignity derived from the higher Branches, which even those who professed them a superior manner, did not always preserve when they delineated individual nature. His Purtraits remind the Spectator of the Invention of History, and the amenity of Landscape. In painting pourtraits, he appeared not to be raised upon that platform; but to descend to it from an higher sphere. his paintings illustrate his Lessons—and his Lessons seem to be derived from his Paintings. He possessed the Theory as perfectly as the Practice of his Art. To be such a painter, he was a profound and penetrating Philosopher. In full affluence of foreign and domestick Fame, admired by the expert in art, and by the learned in Science, courted by the great, caressed by Sovereign powers, and celebrated by distinguished Poets, his Native humility, modesty and Candour never forsook him, even on surprise or provocation, nor was the least degree of arrogance or assumption visible to the most scrutinizing eye, in any part of his Conduct or discourse. His talents of every kind powerful from Nature, and not meanly cultivated by Letters, his social Virtues in all the relations, and all the habitudes of Life renderd him the center of a very great and unparalleled Variety of agreeable Societies, which will be dissipated by his Death. He had too much merit not to excite some Jealously; too much innocence to provoke any Enmity. The loss of no man of his Time can be felt with more sincere, general, and unmixed Sorrow. Burke's tribute was well received and one journalist called it "the eulogium of Apelles pronounced by Pericles". Reynolds was buried at St Paul's Cathedral. In appearance Reynolds was not striking. Slight, he was about 5'6" with dark brown curls, a florid complexion and features which James Boswell thought were "rather too largely and strongly limned." He had a broad face and a cleft chin, and the bridge of his nose was slightly dented; his skin was scarred by smallpox and his upper lip disfigured as a result of falling from a horse as a young man. Edmond Malone asserted that "his appearance at first sight impressed the spectator with the idea of a well-born and well-bred English gentleman." And calmly drink my wine. Of Reynolds what good shall be said? – or what harm? It is to this luke-warm temperament that Frederick W. Hilles, Bodman Professor of English Literature at Yale attributes Reynolds' never having married. In the editorial notes of his compendium Portraits by Sir Joshua Reynolds, Hilles theorizes that "as a corollary one might say that he [Reynolds] was somewhat lacking in a capacity for love", and cites Boswell's notary papers: "He said the reason he would never marry was that every woman whom he liked had grown indifferent to him, and he had been glad he did not marry her." Reynolds' own sister, Frances, who lived with him as housekeeper, took her own negative opinion further still, thinking him "a gloomy tyrant". The presence of family compensated Reynolds for the absence of a wife; he wrote on one occasion to his friend Bennet Langton, that both his sister and niece were away from home "so that I am quite a bachelor". Biographer Ian McIntyre discusses the possibility of Reynolds having enjoyed sexual rendezvous with certain clients, such as Nelly O'Brien (or "My Lady O'Brien", as he playfully dubbed her) and Kitty Fisher, who visited his house for more sittings than were strictly necessary. Claims to this end are, however, purely speculative. Colonel Acland and Lord Sydney, The Archers, 1769. ^ a b c d e Martin Postle, ‘Reynolds, Sir Joshua (1723–1792)’, Oxford Dictionary of National Biography, Oxford University Press, 2004; online edn, Oct 2009. Retrieved 24 Sep 2010. ^ a b c d e f Penny, Nicholas (1986). "The Ambitious Man". Reynolds (Exhibition catalogue). Royal Academy of Arts. pp. 17–18. ^ a b "Giuseppe Marchi". Reynolds (Exhibition catalogue). Royal Academy of Arts. 1986. p. 181. ^ Leslie and Taylor 1865, volume 1, p.102. His pocket book records him as painting 150 sitters in 1758 alone. ^ a b c d Penny, Nicholas (1986). "The Ambitious Man". Reynolds (Exhibition catalogue). Royal Academy of Arts. p. 22. ^ Penny, Nicholas (1986). "The Ambitious Man". Reynolds (Exhibition catalogue). Royal Academy of Arts. p. 24. ^ a b c Northcote:, James. The life of Sir Joshua Reynolds. 2. p. 26. ^ "Suzanna Beckford 1756". Tate Gallery. ^ Newman, John (1986). "Reynolds and Hone". Reynolds (Exhibition catalogue). Royal Academy of Arts. pp. 344–54. ^ "Local History RichmondHill"]. London Borough of Richmond. http://www.richmond.gov.uk/local_history_richmond_hill.pdf. ^ James Boswell, Life of Johnson (Oxford: Oxford University Press, 2008), p. 923. ^ a b McIntyre, p. 427. ^ Desmond Shawe-Taylor, The Georgians: Eighteenth-Century Portraiture and Society (London: Barrie & Jenkins, 1990), p. 49. ^ a b McIntyre, p. 523. ^ a b McIntyre, pp. 524–525. ^ P. J. Marshall and John A. Woods (eds. ), The Correspondence of Edmund Burke. Volume VII. January 1792–August 1794 (Cambridge: Cambridge University Press, 1968), pp. 75–76. James Boswell, Life of Johnson (Oxford: Oxford University Press, 2008). Charles Robert Leslie and Tom. Taylor, Life and Times of Sir Joshua Reynolds (London: John Murray, 1865, 2 volumes). Ian McIntyre, Joshua Reynolds. The Life and Times of the First President of the Royal Academy (London: Allen Lane, 2003). Martin Postle, ‘Reynolds, Sir Joshua (1723–1792)’, Oxford Dictionary of National Biography, Oxford University Press, 2004; online edn, Oct 2009. Retrieved 24 Sep 2010. John Barrell, The Political Theory of Painting from Reynolds to Hazlitt (1986). A. Graves and W. V. Cronin, A History of the Works of Sir Joshua Reynolds (1899–1901, 4 volumes). F. W. Hilles, The Literary Career of Sir Joshua Reynolds (1936). Derek Hudson, Sir Joshua Reynolds: A Personal Study (1958). J. Ingamells and J. Edgcumbe (eds. ), The Letters of Sir Joshua Reynolds (2000). E. Malone (ed. ), The Works of Sir Joshua Reynolds (1798, 3 volumes). D. Mannings, Sir Joshua Reynolds PRA, 1723–92 (1992). J. Northcote, Memoirs of Sir Joshua Reynolds, knt. (1813–15). J. Northcote, The Life of Sir Joshua Reynolds (1818, 2nd edition, 2 volumes). Martin Postle, Sir Joshua Reynolds: The Subject Pictures (1995). Martin Postle, Drawings of Joshua Reynolds. R. Prochno, Joshua Reynolds (1990). E. K. Waterhouse, Reynolds (1941). E. K. Waterhouse, Reynolds (1973). "Reynolds, Joshua". Dictionary of National Biography, 1885–1900​. London: Smith, Elder & Co.
Mary Nesbitt, eighteenth-century courtesan who began her career as Reynolds' model. This page uses content from the English language Wikipedia. The original content was at Joshua Reynolds. The list of authors can be seen in the page history. As with this Familypedia wiki, the content of Wikipedia is available under the Creative Commons License.